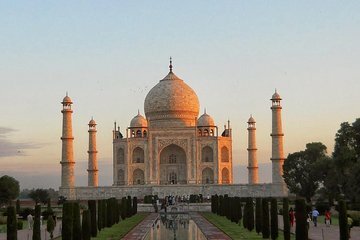 Découvrez le Taj Mahal d'Agra à ses deux moments les plus magiques - le lever et le coucher du soleil - lors de ce voyage de 2 jours sans souci depuis Delhi. Oubliez l'obligation de vous procurer des billets de train ou un moyen de transport indépendant et rendez-vous à Agra en véhicule privé climatisé pour vous assurer de voir le monument classé par l'UNESCO à l'aube et au coucher du soleil. De plus, la visite comprend des visites du fort d'Agra, de Fatehpur Sikri, etc., ainsi que d'un séjour dans un hôtel 3 étoiles à Agra. Assurez-vous de voir le Taj à son meilleur et d'atteindre Agra en voiture privée. Although a very knowledgeable guide who's English was excellent, this Tour is called the sunset and sunrise tour, however after the Sunset tour of the Taj Mahal our guide stated that the tour was over and her time as a guide was finished. Therefore, we never got to see the Taj Mahal for the sunrise. Our driver, who was excellent throughout then took us too Fatiphur Sikri which is again a beautiful place, however we had to pay extra again for a guide as we had no guide to take us, although the trip instructions stated Guides were included?? The visit to the Star of India jewelry stores are nothing but awkward as after showing you a lot of the stones which are beautiful, the store owners then continue to show you everything in the store to try to gain a sale... they continually state that is our choice to buy, but doesn't make it any less awkward. The Taj Mahal is a bucket list experience for sure - getting there, however, without a tour guide seems near impossible. We did not get to see the Taj at sunset OR sunrise due to construction...but it's still breathtaking. Our local guide for the Taj, Raj, was great, and our driver Rakesh was so friendly! Raj also set us up with his photographer friend who took great photos of us and the Taj for 7000 rupees total. The only downside is in visiting all the local shops - marble crafters, carpet markers, jewelry artists, and so on - not because their crafts aren't beautiful, but because they push you to buy things. That part's awkward. That happens, too, outside the Taj and in Akbar's Mausoleum. Overall a very pleasant experience. Pickup on time by a friendly driver with good English and driving skills who gave the first explanations about everything on the way. A local guide from Agra joined there who was very knowledgable and pleasant to be around. I visited Agra Fort around noon and Taj Mahal during the afternoon until sunset hours. Very beautiful! The guide did his best to accomodate for all my interests and was very patient. The hotel in Agra was good and I enjoyed a local restaurant for a very inexpensive but delicious snack at lunch and dined at a restaurant in the evening - both was delicious and nice to my stomach. We visited to handcraft shops of whom one was very skilled in selling and I could not resist. But I do not regret neither :- The only disadvantage on this tour was the season of the year which is rather foggy, so that I decided to exchange the visit at sunrise for some more sleep before we went to Fatepuhr Sikri, a lovely place to see although my time was a little short due to an appointment I had back in Delhi. Also there, the local guide was pleasant and full of knowledge. After a quick stopover and leisurely walk at the Baby Taj Mahal in Agra we drove back to Delhi. It was a pleasant tour which I enjoyed a lot and as woman travelling alone I can say I felt safe at all times.